3D printing, also called additive manufacturing, is the process of creating 3D objects by placing successive layers of a material on top of one another. One common technique for 3D printing is fused-deposition modeling (FDM®), which makes use of rapid prototyping. FDM technology™ creates 3D models by using the process of extrusion. A 3D printer (left) and close-up view of a 3D printer head (right). Images by Rahman, Schott, and Sadhu and taken from their COMSOL Conference 2016 Boston presentation. The extrusion process involves feeding a thermoplastic material into an extruder, which in turn enters a heater and is transformed into a molten thermoplastic that is forced through the extruder’s nozzle. Researchers from North South University, the Department of Plastics Engineering at the University of Massachusetts Lowell, and IRays Teknology Ltd. in Bangladesh studied conventional extruder technology that has been altered to fit a commercial 3D printer. 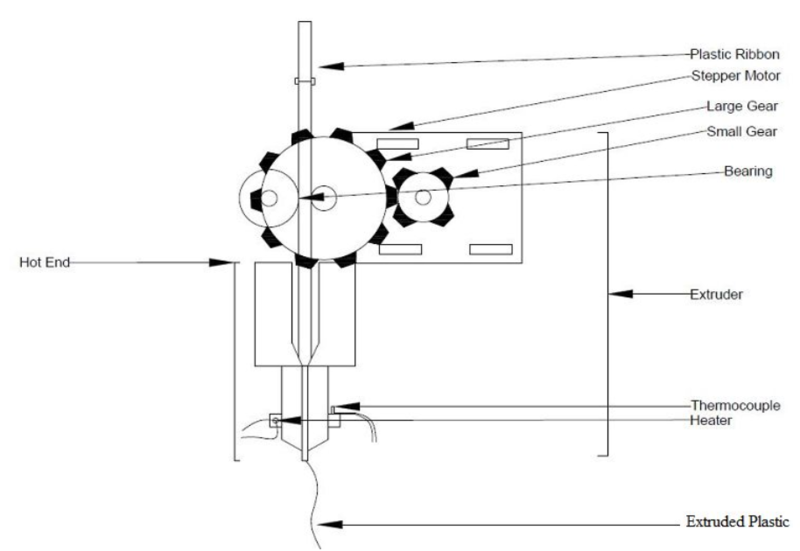 The adapted design uses a continuous plastic ribbon on a large spool that is fed through an extruder, as shown below. The plastic material used in the printer is the thermoplastic polymer acrylonitrile butadiene styrene (ABS), one of the two most common thermoplastics used in FDM®. 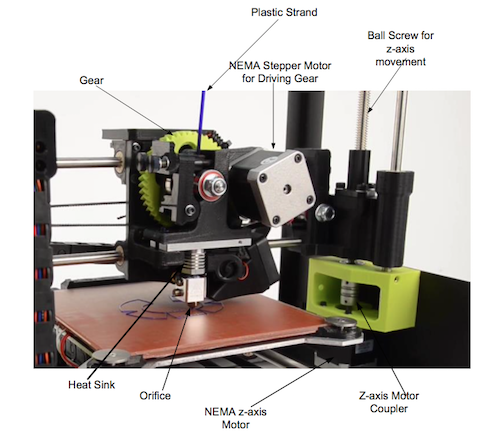 For the printing process used in this research, a computer controls the movement of the 3D extruder head, which creates the layers leading to the buildup of a 3D object. An extruder adapted for a commercial 3D printer. A plastic ribbon is fed from a spool to the extruder/printer, where heating and forced flow extrude a thin and continuous amount of extruded ABS. This process creates layers of hardened ABS, which form the final 3D-printed object. Image by Rahman, Schott, and Sadhu and taken from their COMSOL Conference 2016 Boston paper. 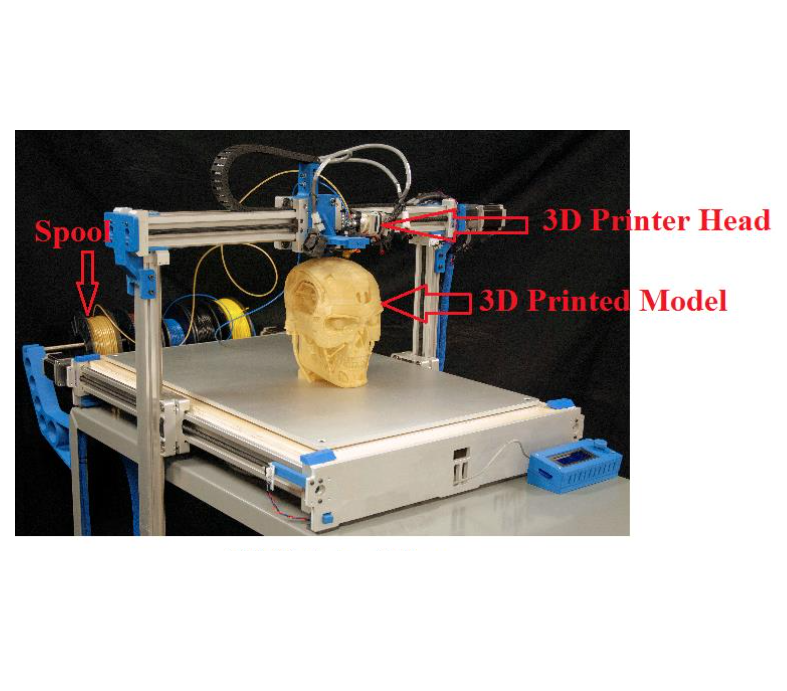 For their study, the researchers wanted to investigate the cooling and transition stages of a 3D printer head with heat transfer simulation. They used the COMSOL Multiphysics® software to identify how different elements affect their 3D printer design. To accurately study the cooling and casting process in a 3D printer, the research team developed a 2D axisymmetric model of a 3D printer head and analyzed its fluid and thermal aspects as well as the change in the tensile modulus. They assumed that ABS flows continuously through the narrow nozzle and that its volume remains constant during the solidification process. Further, the team assumed that the velocity of the ABS is constant and uniform. With this model, the researchers investigated the glass-liquid transition, or the glass transition of ABS. Glass transition is a reversible change that occurs over the glass-transition temperature range. Within this temperature range, an amorphous material like ABS changes from a hard and brittle state to a rubbery and viscous state when exposed to an increase in temperature. This process occurs first when ABS is heated to a molten state in the 3D printer’s extruder and again as it cools and solidifies upon exiting the extruder. This secondary glass-transition change is the key point of focus in this study. Let’s look at the extrusion of ABS from the nozzle, which can be seen in the left image below. The results indicate that the glass transition of ABS occurs successfully. However, the team also aimed to analyze how well this process works. A closer look at the 3D printer head shows that the streamlines near the nozzle form a vortex. In a real-world 3D printer, this eddy flow may generate a nonuniform surface quality that causes problems. 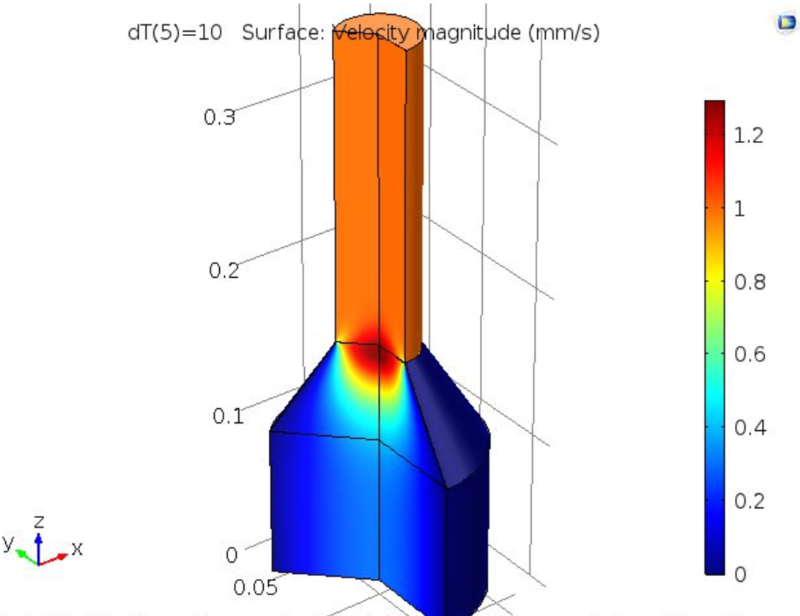 By finding this issue while still in the design phase, engineers can optimize the nozzle design early on in the process. Left: The velocity magnitude resulting from one revolution of the 2D axisymmetric data set. Right: The surface velocity magnitude (mm/s) and total heat flux streamlines of a 3D printer head. Images by Rahman, Schott, and Sadhu and taken from their COMSOL Conference 2016 Boston paper. Next, the team examined the heat flux, as seen in the graphs below. They were able to confirm that the nozzle area has a very large conductive heat flux. This is an expected result, since ABS releases a significant amount of heat during its secondary phase transition. The researchers located the conductive heat flux peak at the flow’s center in the transition zone. By modeling the conductive heat flux at the outer boundary, the researchers found that most of the cooling process happens directly outside the nozzle. 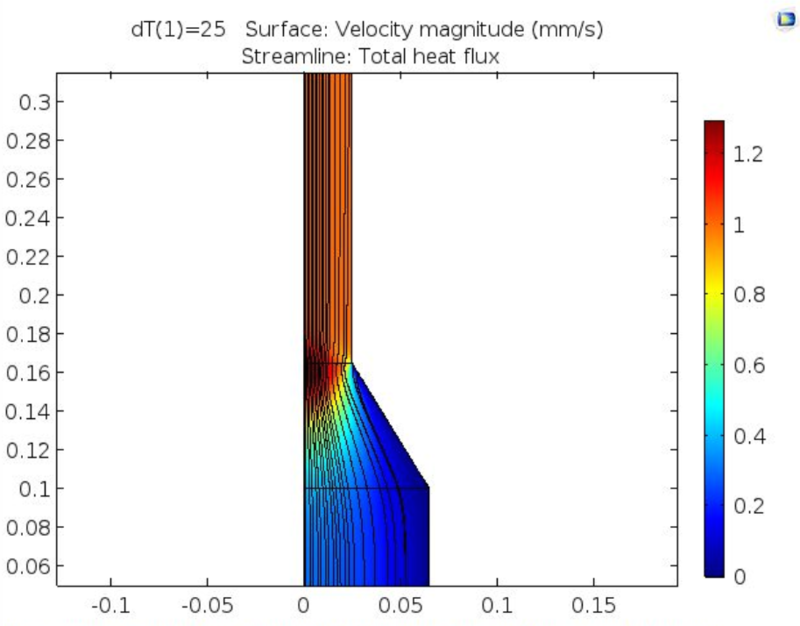 These simulations yielded an interesting conclusion: The heat flux is not constant, but instead varies along the length of the nozzle wall. This information is useful for optimizing the cooling rate and choice of cooling method for a 3D printer. 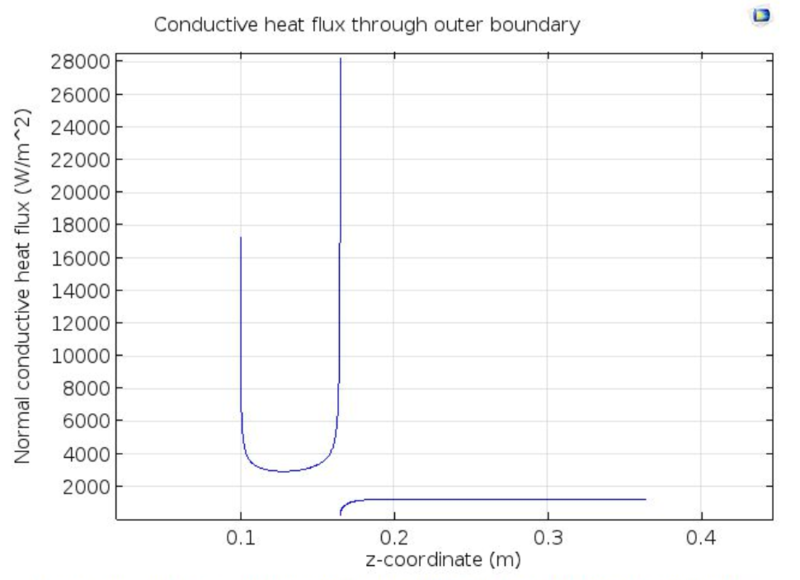 Left: Conductive heat flux through the outer boundary. 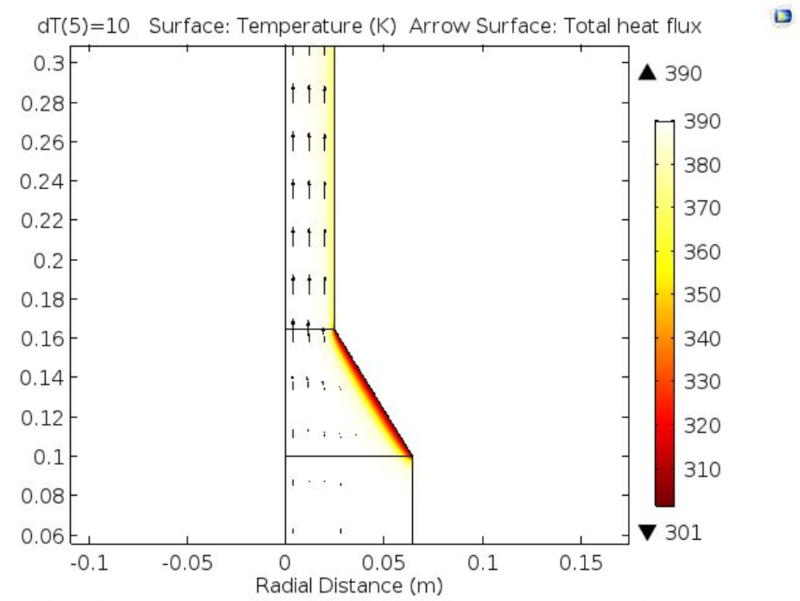 Right: The surface temperature distribution, with arrows indicating the total heat flux direction. Images by Rahman, Schott, and Sadhu and taken from their COMSOL Conference 2016 Boston paper. Switching gears, the researchers were also able to see how different factors affect the glass transition of ABS. For example, the following plot suggests that smaller values of ΔT have a steeper glass transition. The fraction of plastic in a liquid state along the centerline for different values of ΔT. Image by Rahman, Schott, and Sadhu and taken from their COMSOL Conference 2016 Boston paper. 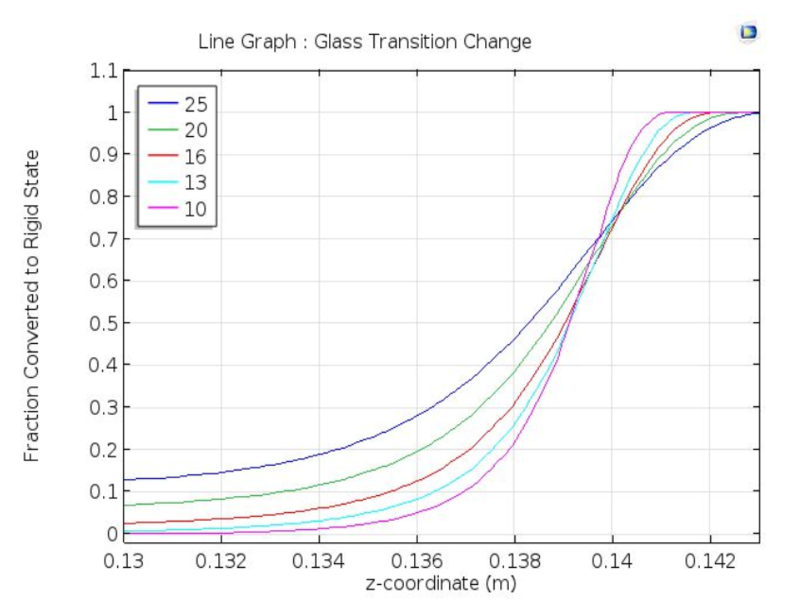 By modeling the glass transition of ABS in a 3D printer head, the researchers located a narrow secondary transition in the glass-transition temperature. 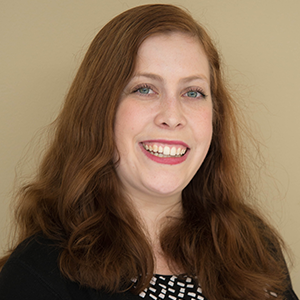 Their simulation research into relevant factors, such as the surface velocity magnitude, heat flux, and surface temperature distribution enables them to better understand 3D printers and use this knowledge to improve their designs. For instance, this research could be used to optimize die designs, helping to ensure that a 3D-printed model cures as quickly as possible. Further, the team noted that they can use heat transfer analysis to predict how filters influence the printer’s cure rate and end-use properties. Find out more about 3D printing and the benefits of heat transfer analysis by exploring the links in the next section. FDM Technology is a trademark of Stratasys, Inc.